Kitano graduated from the College of Mathematical Engineering at Nihon University in Chiba, Japan. 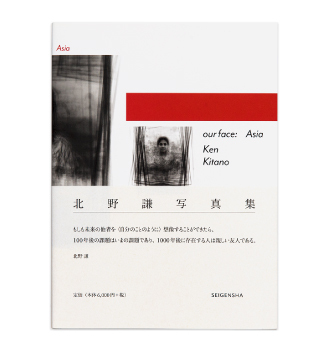 He won the 16th Society of Photography Award in 2004 and the ‘Newcomer’s Award’ of the Photographic Society of Japan in 2007. our face series has been exhibited extensively and collected by major museums in Japan and around the world. Kitano currently lives and works in Tokyo. day light was produced on 4 x 5 negative film using day-long exposure from dusk to dawn; watching the moon was created where Kitano aligned the camera lens with the moon’s trajectory to capture its motion. The misalignments in these images reveal the slippages between time on earth and time expanding outward across the infinite space, as they illuminate the relationships between nature, human life and universe. Kitano’s images push the boundaries of social documentary photography and typological photography, breaking down hierarchies within localized groups, where all people are presented as equal. He explores the possibility of coexistence, using photography medium as a connector, a hub. Rather than establishing a sole figure to represent a certain group, (as most social documentary photography tends to do), these photographs combine together and create a psychic consciousness, and at the same time reinventing a traditional craftsmanship that is quickly fading away. As an addition to the series, Kitano combined and overlapped the portraits he shot of Hong Kong Policemen and Protesters at the Occupy Movement in September 2014, and produced two metaportraits to represent the collective faces of these two groups at the movement.